The blurb: The gates to Frost Hollow Hall loomed before us. They were great tall things, the ironwork all twisted leaves and queer-looking flowers. And they were very definitely shut. Then it goes horribly wrong. The ice breaks, Tilly falls through and almost drowns. At the point of death, a beautiful angel appears in the water and saves her. Kit Barrington’s ghost. Kit needs Tilly to solve the mystery of his death, so that his spirit can rest in peace. 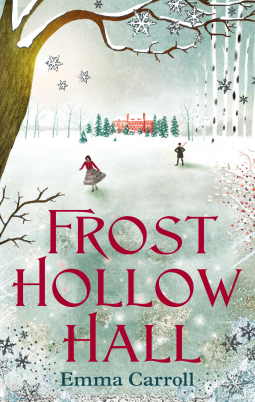 In order to discover all she can, Tilly gets work as a maid at Frost Hollow Hall. But the place makes her flesh crawl. It’s all about the dead here, she’s told, and in the heart of the house she soon discovers all manner of dark secrets . . .
My review: Hmmmmm. I’m a little torn by this book, I think one reason was because whilst I do love a good YA book I felt this was much younger and wasn’t expecting that when I received the proof to read on NetGalley. It’s wonderfully atmospheric, a great ghostly winter’s tale but there was something lacking for me. Possibly narrative depth or the character’s and their interactions. I can’t quite put my finger on it but it was simpler than I’d hoped for, lacking in the real might of a spooky emotional tale. All the elements are there – a long held grief, a forbidden friendship, the isolated old house wrapped in secrets and the frozen lake perfect for ice skating… I finished the book and it was an easy read but I felt it could’ve been so much more.